We are thankful that our hummers have come back, we have bunches and bunches of them! They are soooo much fun to watch, and our Momma really enjoys taking pictures and videos of them, so it's a great thing for all of us! It must be wonderful to see them! We hardly ever see any here, but that's because we don't have anything in our garden for them to feed on! We love hummers. Mom and Dad keep trying to coax them to our yard, but it never works. They planted a special garden, put out feeders...nothing brings them to our yard. Those are great things to be thankful for. I hope we can watch the hummers together sometime soon, Sabrina. I'll bring treats and we can hold paws and watch them and chitter. FABULOUS picture we just love it! 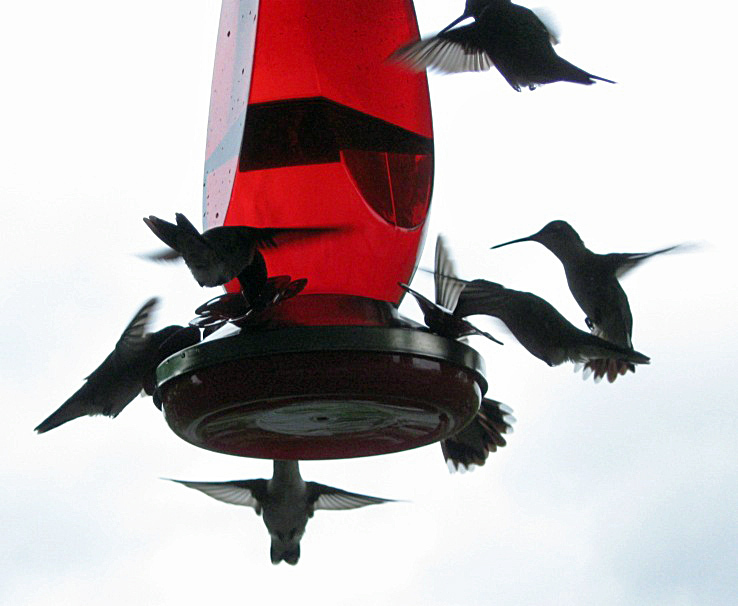 We can't believe how many hummers you got on your feeder! We still haven't seen any...but it's been pretty cool and rainy all week. Maybe this weekend! It's supposed to be nicer. That's a whole lot of hummers. Thats amazing! We have several hummers, but they wont share any of the feeders.